Congratulations on your recycling efforts. Town of Jefferson residents recycled over twice the WI DNR required 106.6 lbs per capita from June 2017 to June 2018. In October 2018, John's reported that our residents recycled nearly 243 tons over the last twelve months. Even though we did well over the past year, we can always find room to improve/increase our recycling efforts. Please continue to make a difference. Do recycle newspaper and cardboard. Reduce your garbage. Don’t burn it. Do properly dispose of hazardous chemicals and drugs. Call 920-674-7430 for additional information. Please see the attached brochure for dates and times. Call (920) 674-7430 for additional information. Remember, John’s Disposal Services, Inc. accepts appliances, tires, used drain oil, etc., on its regular recycling route. Please call ahead for large item(s) (262) 473-4700. 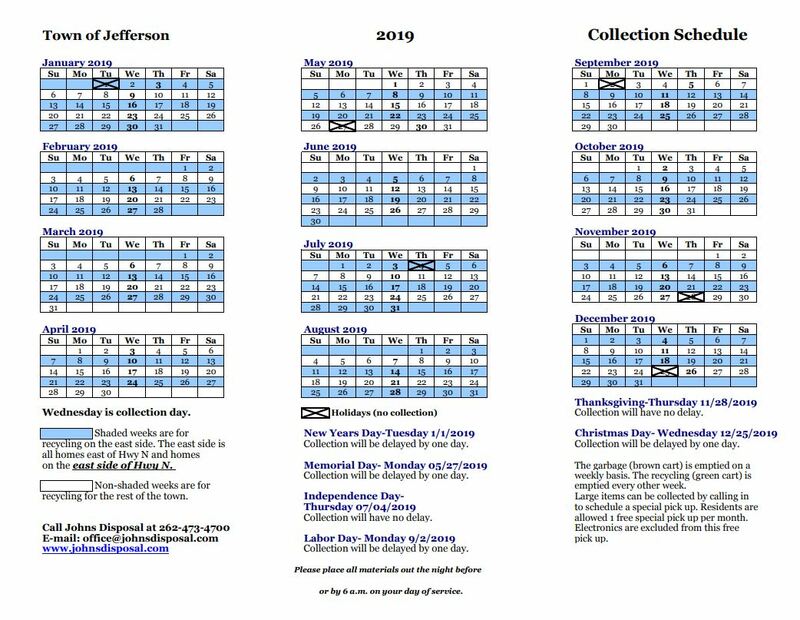 The Town of Jefferson garbage/recycling pickup day is Wednesday. Please refer to the detailed explanation below the schedule.